University of Utah's Moran Eye Center in partnership with Mahi International Foundation (www.mahi-intl.org) and the FSM Department of Health and Social Affairs returned to Micronesia for their 4th visit and outreach from October 17th through November 6th 2017. This year’s focus was centered on Pohnpei State Hospital’s first ophthalmologist Dr. Padwick Gallen and eye outreach in Chuuk State. The visit began with Moran Eye Center’s Dr. Eric Hansen training and supervising Dr. Gallen in the most modern techniques of cataract surgeries. They completed over 16 modern day cataract surgeries known as phacoemulsification making him the first Micronesian phaco-trained ophthalmologist in the FSM. The following two weeks (October 23rd through November 3rd) was spent with a team of eye care professionals led by Dr. Craig Chaya, state outreach nurses and community health workers. The team traversed by boat the small islands around Chuuk Lagoon: Tonowas, Udot, Pata, and Toll, Feichuuk. The team screened and examined the people every day, gave out spectacle glasses and identified patients that needed surgery for the following week. The second week was focused in Weno and continued with full eye examinations, prescribing spectacle glasses and medicines as well as completing surgery for those who needed it. In total, 978 comprehensive eye exams were completed, 940 reading glasses were given to patients as well as 170 prescription ophthalmic glasses. 55 patients were treated with laser surgery while another 250 patients underwent surgery for various conditions including cataract, pterygium and other treatable causes of eye blindness. 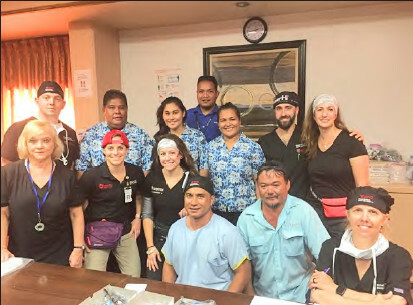 The last week of the visit was spent in direct supervision and training of Dr. Gallen at Chuuk State Hospital where he successfully completed another 20 phaco cataract surgeries. Eye care for any nation is critical for the economic and social welfare of its people not only for education, but for daily working and livelihood. The Moran Eye Center at the University of Utah and Mahi International is committed to the people of Micronesia and long-term sustainable eye care. This has been shown in the more than $500,000 spent on eye care in the FSM over the last 4 years which does not include the time and resources from some of the leading experts in vision and ophthalmology of the United States. Along with the satisfying accomplishment of direct care by the visiting team this past month, perhaps one of the most notable achievements was the presentation of a National Eye Care Plan to Mr. Marcus Samo, Deputy Secretary of Health, FSM. In order to continue this vital work of sustainable eye care for all Micronesians, the National Eye Care Plan needs the full support of the state and federal governments. With the support of the FSM government and the state governments, eye care for all Micronesians is reachable and obtainable.